These have rice cracker shells and actually, they do have a pretty satisfying crunch. I have to say, though, that I am a little bit over “sea salt” as a flavor. When I was a kid, we called that “plain.” Although two of the flavors of this item are not vegan (nacho and honey mustard), the other four flavors are, and I’d be fine with seeing these again (a different variety) in a future box. These are just freeze-dried apples. I’m pretty sure I’ve received them a dozen times before in various snack subscription boxes. They are not too high in calories and they are definitely more shelf stable than fresh fruit. I’ve tried various brands of ginger chews in the past, including Chimes (both flavored and original). These are mostly sugar and they are super sticky. I’ve handed them over to my husband because, although I do like them, I’m worried about accidentally removing the Invisalign attachments from my teeth. I haven’t eaten an Oreo for decades (when I was a kid I liked the filling but not the outer cookie part). These are a vegan, natural version of Oreos (although apparently milk ingredients have been removed from US Oreos so those are now vegan?). I did enjoy them but I was still more of a fan of the filling than the cookie part, so I guess some things don’t change. Although this is listed on the Vegan Rob’s website, if you click the link for it, you get a 404 error. So I think these are new and not available for purchase yet. It is a fruit and grain bar that allegedly has probiotics. I have to say, this tastes WAY better than actual kombucha (which is so acidic I can feel it eating away at my tooth enamel) although I did notice a slight vinegar-like scent to it (which my husband did not, so maybe my sense of smell was over-active that day). Otherwise, this is pretty similar to a granola bar. I received the same item in FitSnack Box this month (review coming soon). We received a different flavor of these from Vegan Cuts last month. These are quite starchy and another example of an item I think I’d find more interesting in a flavor other than “sea salt.” If you can imagine a cracker made of wheat (these are durum wheat instead of bread wheat, but for the purposes of this product it doesn’t make a big difference), you’ll come pretty close to knowing what this is like. I like this little guy, but it is pretty small to retail for $1. My husband and I both thought it was rather like eating compressed PB2 (powdered peanut butter), although it apparently does have gluten-free oats and sugar as well. That is not to say we didn’t enjoy it, because we are both fans of peanut snacks and this was no exception. This is bagged popcorn with cinnamon flavor and it is pretty tasty. My husband finished his (which he did not do for a smaller amount of a different popcorn from FitSnack Box). There were a lot of fragments in the bottom of the bag. This is a British product and I’m not sure you can actually order it in the US. At any rate, the price above was calculated using the Google currency converter so it could vary a little by the day. This is a raw bar that includes matcha, hence the name. The cacao is mild and the goji is the somewhat-unfamiliar, fruity flavor. These are not bad, but I feel like there are a lot of competing products out there and I’m not sure what makes this one stand out. Seeing Harney and Sons takes me back to the days my husband and I were still dating and used to spend Friday evenings at Barnes and Noble (before they got rid of half the books and put toys in, instead…). We would buy tea – this brand is what they carried – and walk around the store and I would spend like $100 on fantasy novels. Anyway, this is a lightly-flavored tropical green tea (needs to get rid of the lemongrass, but the coconut and ginger and vanilla are good). I drank this at work so I don’t have a picture of it brewed. Verdict: This month’s Vegan Cuts Snack Box had 11 items for an average value per item of about $2.09. Most of the items were new to me, which is always nice, though there were some items (apples, ginger chews, pasta chips) I’ve seen quite a few times before (not just from Vegan Cuts). My favorites this month were probably the little peanut bite and the popcorn, and the almonds have potential though their flavor is pretty basic. This is not the best month in terms of overall value, because although some items (jerky, sandwich cookies) are well above the average, a single tea bag or 0.32 oz of freeze dried apples is not going to sell for over $2. If the goal is to discover new snacks and you are vegan or vegetarian, this box may still be worth getting. Can you still get this box if you sign up today? No, your first box would be September’s box, but some of the products may be available from the Vegan Cuts shop. Check out our latest spoilers! Value Breakdown: At $22.95 for this box, you are paying about $2.09 per item. 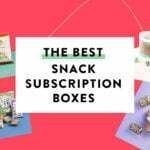 What do you think of the August Vegan Cuts Snack Box? To answer your semi-question, yes, Oreos are vegan.